Designer handbags: the prohibited dream of every woman! 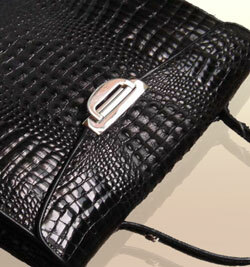 Designer Handbags, Authentic Handbags and Replica Handbags. you can look for an authentic bag of equal quality to the designer one, without the over-inflated prices of the designer label. Your cheapest option may well be to order a replica handbag online from a country that specialises in knock-offs of designer labels. What will you get for your money though? For a few days your copy may look like the handbag you dreamt of, but soon the glossy finish wears off and the cheap materials show their true colors. The stitching is the next thing to give and your bag very soon looks like the cheap imitation it is, leaving you feeling disappointed and let down. There are some very convincing counterfeit bags out there so beware supposed designer bags that seem fantastically cheap. Not only are they unlikely to be the real thing, but the sale of counterfeit goods is often used to fund the underworld of crime, so your hard-earned cash could be supporting terrorists or drugs syndicates. Then, as very often happens, many children are employed in the realisation of these products. They are dramatically exploited every day and obbliged to work in very dirty igenical conditions, without any possibility to play, to receive an education attending the school or to enjoy themselves. These innocent children are condamned to a very sad life, deprived of one of the most special moments in an human being’s life: his CHILDHOOD. There is a middle way between re-mortgaging your house for the designer label bag and suffering the disappointment of the imitation replica. You can look for an authentic, quality handbag from a reputable Italian maker. Italy has long been renowned for its skilled designers and artisans and here you will find companies that specialize in top quality leather handbags and accessories. You may not find the exact same bag as the designer one you saw in Vogue, but you will forget what it even looked like, as you browse exciting ranges of up-to the minute, original and stunning Italian designs. The materials they are made in are of excellent quality and they are lovingly and carefully hand-crafted by the best Italian artisans, making them works of art in themselves. Some selected companies even offer a custom-made bag service, so you can choose the color and leather of your favorite design and have it made especially for you. You don't get more exclusive and prestigious than that! When you take delivery of your authentic Italian handbag, you will fall completely in love with the sensuous softness of the leather and be amazed that such high quality could be so affordable; not only that but be an investment too, as the bag only improves its look with use and age, gaining a patina and character of its own that speaks of genuine Italian style and quality. So if that designer bag is beyond your reach, think laterally and show yourself to be a modern woman who thinks for herself, who would never be taken in by cheap imitations. You value quality and style, so show your individuality by seeking out a unique and authentic Italian handbag.